898 pages | 319 B/W Illus. To best serve current and future generations, infrastructure needs to be resilient to the changing world while using limited resources in a sustainable manner. Research on and funding towards sustainability and resilience are growing rapidly, and significant research is being carried out at a number of institutions and centers worldwide. 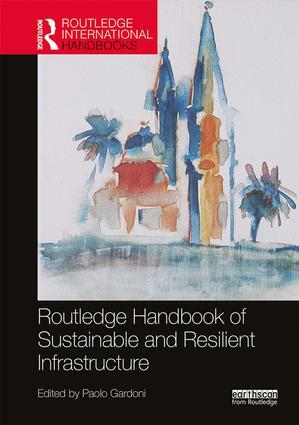 This handbook brings together current research on sustainable and resilient infrastructure and, in particular, stresses the fundamental nexus between sustainability and resilience. It aims to coalesce work from a large and diverse group of contributors across a wide range of disciplines including engineering, technology and informatics, urban planning, public policy, economics, and finance. Not only does it present a theoretical formulation of sustainability and resilience but it also demonstrates how these ideals can be realized in practice. This work will provide a reference text to students and scholars of a number of disciplines. Paolo Gardoni is a Professor and Excellence Faculty Scholar in the Department of Civil and Environmental Engineering at the University of Illinois at Urbana-Champaign. He is the founder and Editor-in-Chief of the international journal Sustainable and Resilient Infrastructure.